Raising awareness of and support for vocations to the home missions is always on Glenmary’s mind. 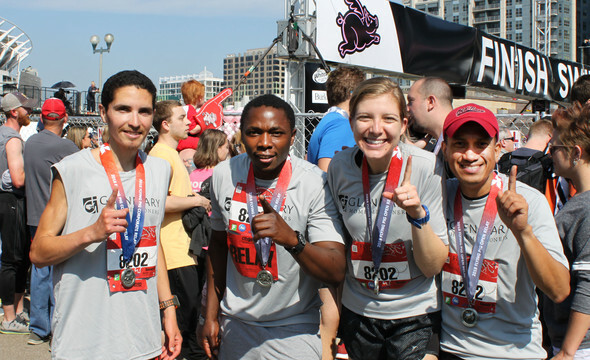 This year Glenmary has partnered with The Cincinnati Flying Pig Marathon for an easy way, and a somewhat physically challenging way, to do both. Supporters can win $5,000 for themselves and another $5,000 for Glenmary (or a charity of their choice) through the purchase of a $5 pig. Each pig is effectively a ticket in the raffle. Thanks to corporate sponsorship, the full $5 of each pig is to the raffle participant’s designated charity. To participate visit PiggestRaffle.com. Select Glenmary from the drop-down menu when purchasing your pigs. In addition to the top cash prize, second place will receive a two-year lease on a Toyota Prius and third wins a Cincinnati getaway experience package valued at $1,500. Now for the physical challenge! The athletically minded can sign for the Flying Pig’s associated 5K race as part of the Glenmary 5K walk/run for Vocations. This is NOT a separate event from the Flying Pig 5K, but an opportunity for runners and walkers of all levels to promote vocations while showing support and appreciation for Glenmary. Those who register in this way will have the opportunity to purchase a race-related Glenmary t-shirt. If enough people select Glenmary as their charity race partner, the society will also receive part of the registration fee back as a donation. For those unable to participate but still wish to support the Glenmary’s 5K team, donations can be made HERE. See below for the step-by-step of how to register to run/walk with Glenmary at the Flying Pig 5k. The Cincinnati Flying Pig Marathon is a multi-race event held each May in Ohio. In 2018, a team made of Glenmary men-in-formation and lay staff competed to win the City Dash 4-Person open relay (co-ed division) at the event. 2. It will take you to Race Roster, the online registration partner of the Flying Pig. Select “Click here for Charity Partner Registration.” Race Roster will ask you to sign up or sign in before you can continue. 5. In the “Race Info” section, choose “Age Group,” if you plan to run, or “Walking” if you plan to walk the course. 7. Sign/Initial the Flying Pig Liability Waiver and Release Form. 8. There is an option to donate. Select Glenmary if so inclined. 10. Say one Hail Mary for an increase of vocations to Glenmary priesthood, brotherhood, and sisterhood.